In Athens, the capital city of Greece, two policemen got into a bit of a fight with a group of young boys on Dec 6. The police fired a few gun shots, and a 15-year old boy named Alexandros was killed. This has caused one of the biggest riots in the country in a long time. For over 12 days now, thousands of people have been throwing things at buildings, banks, and shops. Planes, trains, and buses have been affected. The protestors have broken into a TV studio and interrupted a show, and they have hung banners near the famous building, the Parthenon. Protests have even spread to other countries in Europe such as France, Spain, Italy, and Denmark. The Greek civilization has been around for over three thousand years. The Greeks have given us many things. The Olympic Games were started in 776BC in Olympia, Greece, and continue to be one of the world’s most popular events. The Greeks also gave us democracy – a society where citizens can vote and make decisions about laws, and can choose their rulers. Democracy was first started in Greece around 2500 years ago. Without the Greeks, w mght b wrtng lk ths – because they gave us vowels! Even the word “alphabet” comes from the first two letters of the Greek alphabet – “Alpha” and “Beta”. 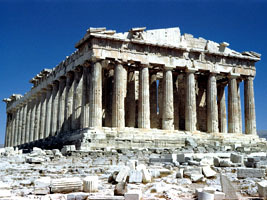 One of the most famous buildings in Greece is the Parthenon in Athens. It was built around 440 BC as a temple for a Greek goddess. The Parthenon was later converted into a church, then a mosque, and then part of the building was destroyed during a war in the 1600s.